AzhwAr says that those who practice (understand/recite) this decad will first be honored by/like nithyasUris and cut their relationship with this samsAram (material world). The dhEvas (celestial beings) who wanted to become immortal, worshipped emperumAn (like AzhwAr himself worshipped him) who churned the milk ocean. nammAzhwAr who belongs to AzhwArthirunagari which is beautiful due to the presence of many gardens, sung such emperumAn in this decad (among the 1000 pAsurams) which is like the nectar that came out of milk ocean. Those who can understand this decad will raise to the level of nithyasUris and eliminate their birth in this world which is like being in a prison. Similar to vAdhi kEsari azhagiya maNavALa jIyar‘s translation. amarargaL thozhuthu ezha – “‘uppuchchARu kiLaRuvatheppOthO?’ enRu kidakkiRa dhEvajAthi’ – dhEvas who were waiting for the salt-essence (amirtham – nectar is explained like this since it merely brings immortality for a longer period in comparison to human life, but its not going to liberate any one from the clutches of samsAram) to come out. alai kadal kadainthavan thannai – With garlanded beautiful/broad shoulders, emperumAn was churning the ocean. “oru kadal oru kadalai ninRu kadaiyumApOlE” (like one ocean is churning another ocean) – bhagavan is an ocean of mercy, kshIrAbdhi is milk ocean. 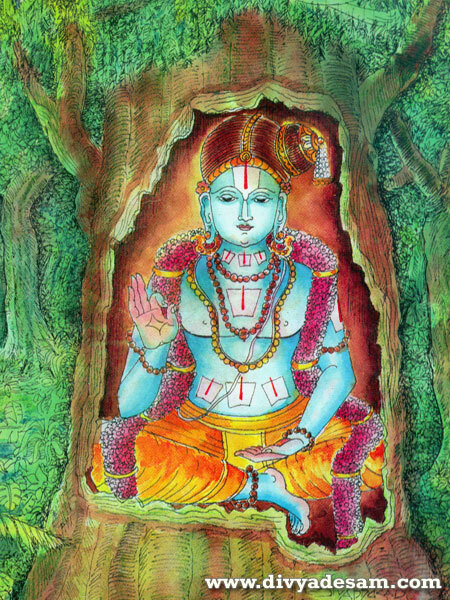 thozhudhezha – AzhwAr offered himself being overwhelmed by emperumAn‘s auspicious qualities, dhEvas became mesmerized by the beauty of emperumAn. satakOpan kuRREvalgaL – serving AzhwAr through words. In case of complete personalities, one cannot do anything more than glorifying through words (since they already have everything). Even nithyasUris are engaged in glorifying emperumAn through words only as explained in rig vEdham (vishNu sUktham) “…thadhviprAsO vipanyava:..” (the most learned ones who are well-capable to glorify). amar suvai Ayiram – those most enjoyable 1000 pAsurams – this indicates that one need not glorify emperumAn as duty-bound but will glorify out of great desire (due to the most enjoyable nature of the pAsurams and emperumAn). avaRRinuL ivai paththum – Like its explained in periya thirumozhi 6.1.2 “viNNavar amudhuNa amudhil varum peNNamudhuNda” (while the dhEvas were enjoying the nectar, emperumAn accepted/enjoyed srI mahAlakshmi who is the real nectar), this decad is the most relishable among all of thiruvAimozhi. avaRRinuL ivai paththum vallAr amararOdu uyarvil chenRu aRuvam tham piRavi am chiRaiyE – Those who are able to meditate on this decad, will achieve the greatness of nithyasUris and then will have the shackles of birth in this samsAram removed. When a king gifts something to some one, it will reach the person surely. Similarly, when emperumAn himself considers him to be nithyasUri, his existence in this samsAram will be terminated surely and he will reach paramapadham. If a prince is imprisoned for some reason, when he needs to be released, he will first be crowned and then cut his shackles (to be freed). Similarly, first such persons who learn this decad will be considered as nithyasUris and subsequently, their binding in this samsAram will be removed. amararOdu uyarvil chenRu aRuvam tham piRavi am chiRaiyE – This is also explained as “one will reach with the help of AdhivAhikas (who are celestial beings, who help the AthmA (after death of the gross body) travel through different layers of the material world and reach the banks of vrajA river) and have their subtle body also removed (to get a new spiritual body before entering paramapadham). The result of this padhigam (decad) is as explained by gIthAchAryan in gIthA 4.9 “thyakthvA dhEham punar janma naithi mAmEthi” (after giving up this body, there is no birth again in this material world and one will reach me). nampiLLai summarizes the whole decad in the end. In the 1st pAsuram, AzhwAr said emperumAn is sulabhan (easily approachable). In the 2nd pAsuram, AzhwAr explained that saulabhyam in detail. In the 3rd pAsuram, AzhwAr said that his avathAra rahasyam cannot be understood by any one. In the 4th pAsuram, AzhwAr said that his avathAra rahasyam can be understood by those who are surrendered unto him and not be understood by those who are not surrendered unto him. In the 5th pAsuram, AzhwAr instructs everyone to approach him through the bhakthi mArgam (the path of devotion) that was explained by himself. In the 6th pAsuram, AzhwAr explained the nature of emperumAn and how to approach him. In the 7th pAsuram, AzhwAr said since you are having short life span, surrender unto him quickly. In the 8th pAsuram, AzhwAr said while surrendering unto him, all the obstacles will be removed. In the 9th pAsuram, AzhwAr explained the reason for avathArams of emperumAn who is the cause of brahmA, rudhran, etc. In the 10th pAsuram, AzhwAr tried to enjoy such emperumAn with his mind, words and deeds. In the last pAsuram, AzhwAr explained the fruits of those who learn/practice this decad. Thus ends the English translation for thiruvAimozhi 1st centum 3rd decad. In the next article we will see the next padhigam (decad). This entry was posted in thiruvAimozhi, thiruvAimozhi 1st centum on July 8, 2015 by Sarathy Thothathri.